In 1980, Barbour introduces the Bedale waxed cotton jacket. A light, hardwearing, short length jacket originally introduced as a riding jacket by Margaret Barbour. 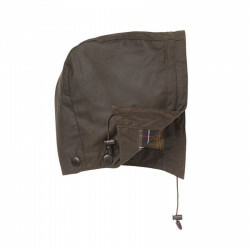 The Barbour Bedale is a versatile, stylish garment quite popular amongst all ages. It was recently worn at the Glastonbury Festival by the Artic Monkeys, Lily Allen or television presenter Alexa Chung. Made with mediumweight waxed cotton (170g - 60oz) the Bedale takes an optional quilted lining and hood for extra wind and rain protection. The classic features of a Barbour jacket: two way zip with brass string, stormfly flap with snap buttons, two large bellow pockets, two handwarmer pockets, corduroy collar studded for optional hood. A Bedale jacket features 160 items, 49 pieces of fabric, 103 seams and finishes with 8 packaging parts. 36 people take part in the making of the jacket in the Barbour workshops. A versatile and warm lining to zip on Beaufort & Bedale jackets or worn as a waistcoat. Use clean cloth or sponge only.